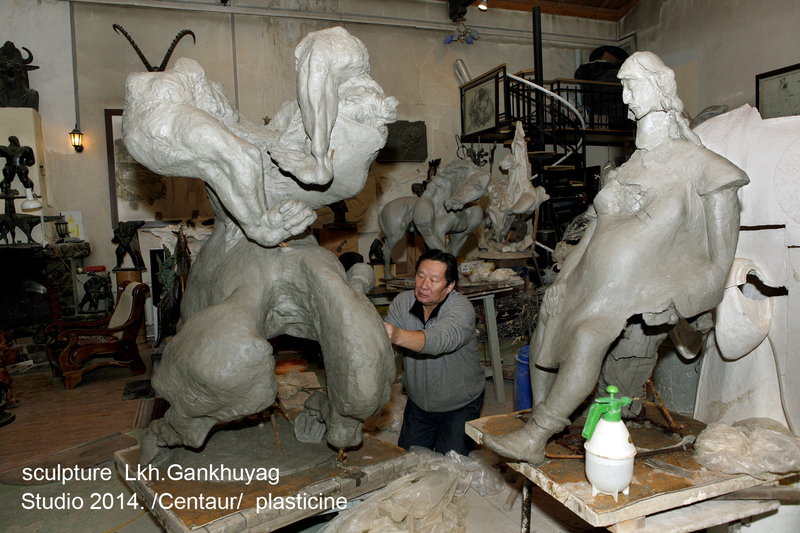 The award winning and internationally acclaimed sculptor, Gankhuyag, based in Ulaan　Bataar, has won distinction and meritorious acclaim for his masterful employment of figurative composition and relief. 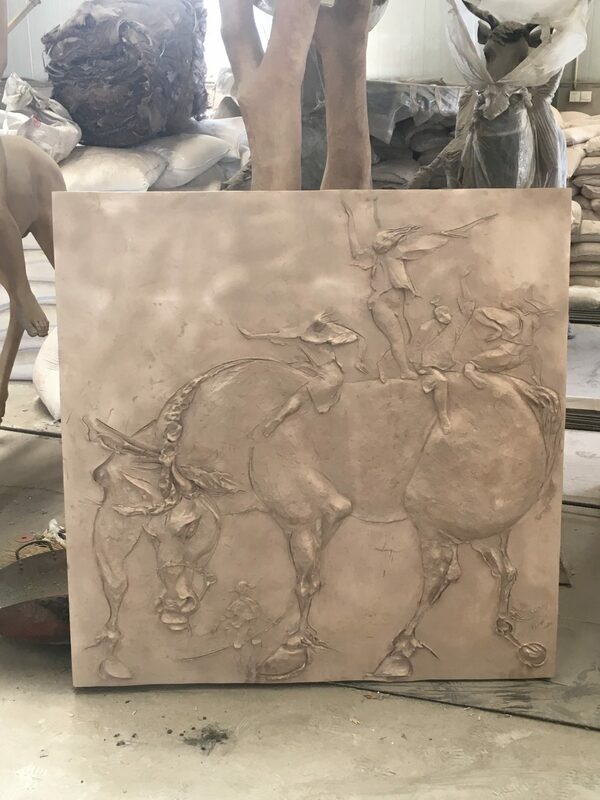 The artist appears to have drawn inspiration from not only the native mythology and traditions indigenous to his native soil, yet further, found creative impetus in furthering the limitations of academic formalism owing to neo-classicism and naturalism. 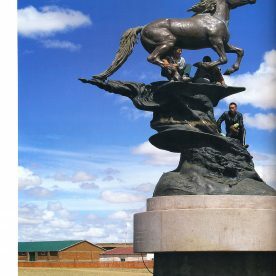 monumental, one inherits a sense of latent tension in their composition and nuance that infers beyond the spatial capacity of each figure, an ulterior existence of a spiritual nature is embodied. 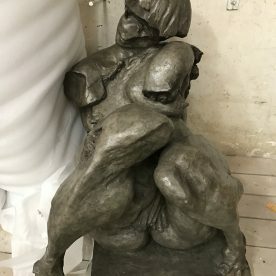 The sculptural expressions of the artist vary in dimension and form, yet the quality of the essence of each subject remains coherent, be it within monumental realist motif or latter series of abstraction. 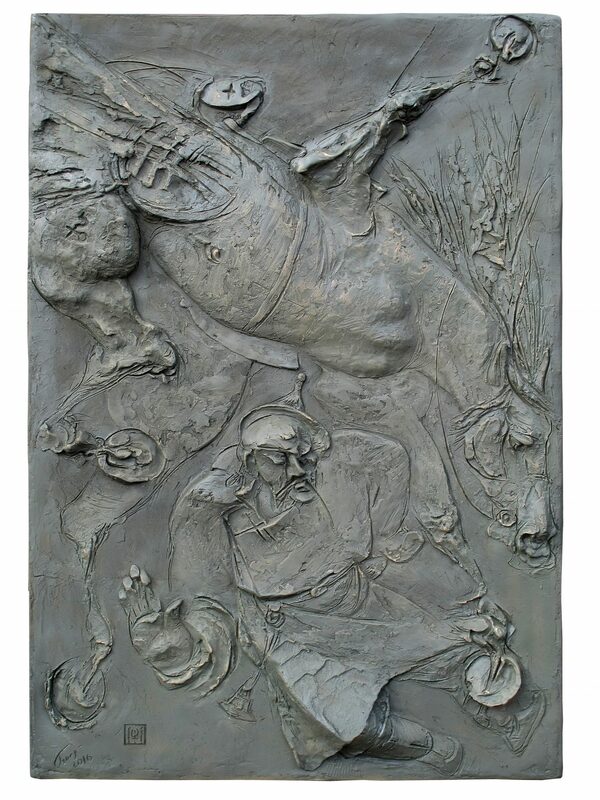 Academically trained at the renowned National Academy of Art in Ulaan Bataar, the artist doubtlessly owes to traditions ascribed to the Russian post-impressionist or neo-classical modalities, while we witness an experimentation in his maturity, both of subject and thematic realisation, which operates to incorporate native culture and surpass the conventions of pedagogy. The artists appears intent to return to sources near forgotten in formal history and the figures insist on that revisionist examination of a “soul” non- European, a breathe which survives silently throughout the era of neo-colonial purport. 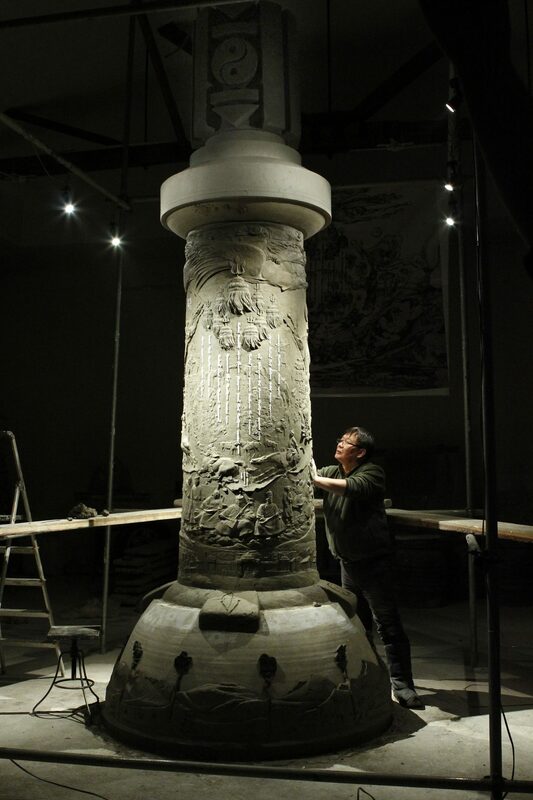 To capture the atmospheric space of the spiritual and juxtapose the individual subject against the fallacy of historical travesty simultaneous to that of an aestheticism which might best be described as being transient:here is the paradoxical pedestal for the artist at work. The chief distinction of the artist might lie in his unusual dexterity in a transmutation of spiritual animus with abstraction or realism, a morph quality which reveals worlds external and internal in the simulacrum of the actual of life. 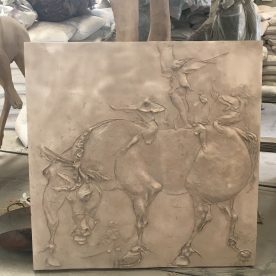 Noble and wild steeds are placed amidst visual fields which evoke the power of nature, dynamic miniatures depict an impossible force within their stasis. 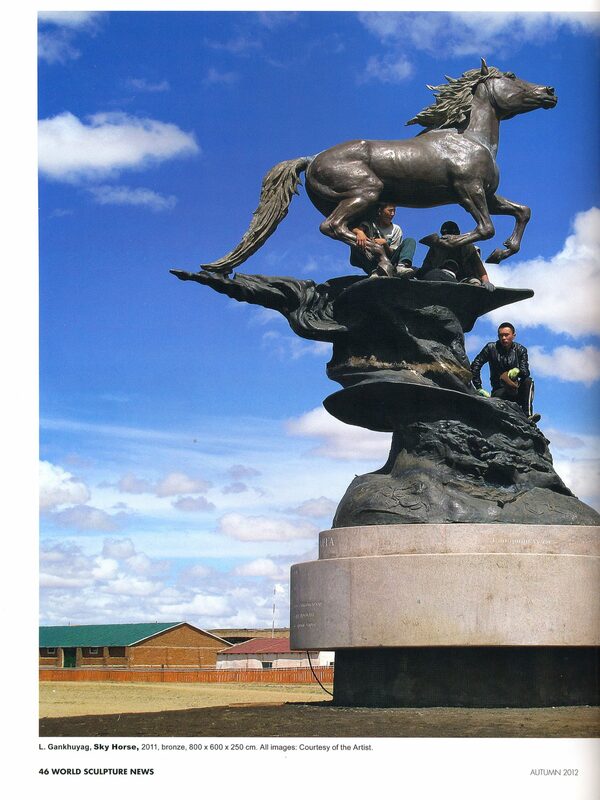 Gankhuyag embraces a dramatic sojourn in his artistic advent, one which revels in realms imaginary yet real. The works suggest a preservation of nature, remind of the unequivocal beauty and power of nature, and humankind’s fragility within. 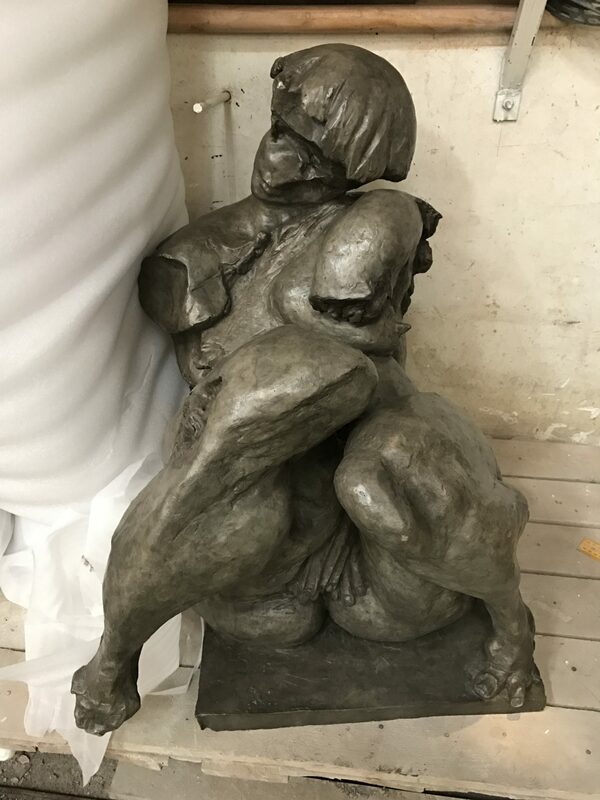 The artist has surpassed predominant Eurocentric aesthetics having arrived at a masterful state of expression which proves ingenious in the visual evidence at hand: the latent tension of Rodin with a degree of abstract reductivism which might humble Brancusi. The above mention are to illustrate the radically of early masters within what was to become known as contemporaneous, moreover, to demarcate that the sculptural act remains a pilgrimage of individual conscience within a spatial time. Gankhuyag employs the same contest of material engagement and technical obstacle, while in search of an expression individual. An artistic demarche that signals the primacy of nature wherein leitmotif and nuance desist conventions deemed Occidental (or, that of the necessary) as he spatially attests to truths underwritten in contemporary and traditional culture and history. The coherence of a methodology which desists contemporaneous trends to opt for synthetic materials, mass replication and similar visual machinations (ie. pop centric mass production) and that of a process which is essentially intrinsic in nature, rather than sheer intellectualism and conceptual fabrication, may ostracise the artist from speculations as to what is justifiably authentic in the light of contemporary practice. I may return to the broader spectrum, wherein the question of sculptural presentation spans millennia and proves as a modal bridge or disparate expression throughout whatever era or phenomena ascribed as being credible in the anecdotal time which we entitle “history”. 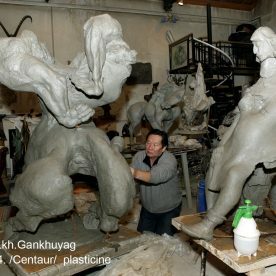 It is in this regard, that while Gankhuyag proves to neither belong to the conceptual/spatial artist working in sculptural form, or, that of the stoic classicist who might insist on the aesthetic primacy of post-Renaissance extenuations in content and form, he nonetheless proves exemplary in the act of creation. We return to the importance of technical expertise and a sense of furthering the limitations of an immediately recognisable realism by way of the selection of subject and the actual modifications enhanced by an abstraction of the irreducible. 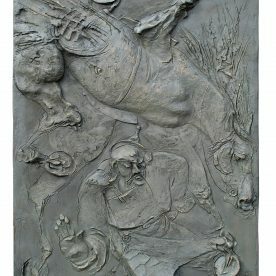 This spiritual diffusion, here enhanced, while historically “evident” in non-tangible creations for the better part, appears an adept accomplishment in a man who has witnessed dramatic socio-political changes, while the vernacular flux of the advent of the contemporary and revisionism which seeks to resurrect (impossibly?) 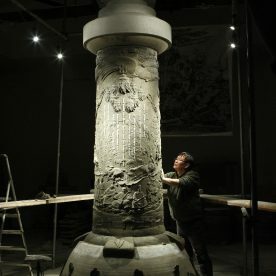 the actual antiquity of legend in Mongolia today. witnesses despite origin or national identification, is an individual whose passion proves torrential, if we are reminded of the calm within the eye of the storm. By process and philosophical disposition, Gankhuyag signals that the “other” in fact, never was, and history is scarcely derived of the past, rather, sheer episodes of an imaginary projection.